Rinse raspberries in a colander. Place raspberries in a large bowl and gently mash the raspberries with a potato masher. You should still have a few chunks of raspberries when you are done mashing them. Measure the crushed berries. You should have exactly 3 cups of crushed berries. If you don't have that exact amount, either add more raspberries or remove some so that you have exactly 3 cups. Stir in 1 cup of the sugar into the raspberry mixture. Stir until the sugar is dissolved. Stir in the remaining 4 1/4 cups sugar. Let raspberry mixture sit for 10 minutes. In a small sauce pan, stir together Sure Jell pectin and 3/4 cup water. Bring to a boil. Boil for 1 minute, stirring constantly. Remove pan from the heat. Stir pectin mixture into the raspberries. Stir constantly until mixture is dissolved. 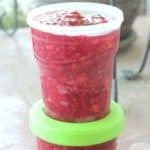 Pour raspberry jam into prepared canning jars or freezer containers, leaving 1/2 inch head space. Place lids on tops of containers. Label the containers. Allow jam to sit out on the counter for 24 hours. After 24 hours, place the containers in the freezer. The raspberry jam can be stored in the freezer for up to one year.